The Holy Family Chapter is a Benedictine Oblate community under the pastoral care of Christ the King Russian Orthodox Church (Western Rite), located in Tullytown, PA, a northeastern suburb of Philadelphia. We meet monthly at Christ the King every first Saturday, beginning with Liturgy at 9 am, followed by our meeting in Parish Hall. You do not need to be Orthodox to visit or join the Holy Family Chapter – we also count in our membership Roman Catholic oblates, and welcome Christians of all faith backgrounds to visit and become members. We first formed as a Benedictine Chapter on October 1, 2008, with two Sisters and one Oblate; over time, the inevitable changes of life caused the Chapter to slowly cease to function. In 2015 there was a renewal of interest within the Parish, and so our pastor decided to revive the Chapter. In October of 2015, with one of the original Sisters and two of the remaining oblates, the Holy Family Chapter began again with our first meeting of potential new members. In November 2015, five candidates were received as Oblate Novices and began their official time of study toward Oblature. How does one become an Oblate? Christians of all faith traditions may become Benedictine Oblates. An oblate must simply desire to learn about and follow the Benedictine way in their life circumstances. Oblate life is formed through community. The oblate is affiliated spiritually with a monastery and thus shares in the prayer, work, love and commitment of the community. The oblates also form community in chapters and among their family, friends and church. By being part of the Benedictine community, the oblate is able to live more fully the Christian life. If you feel God is calling you to life as an Oblate, begin by attending meetings at a Chapter near you. 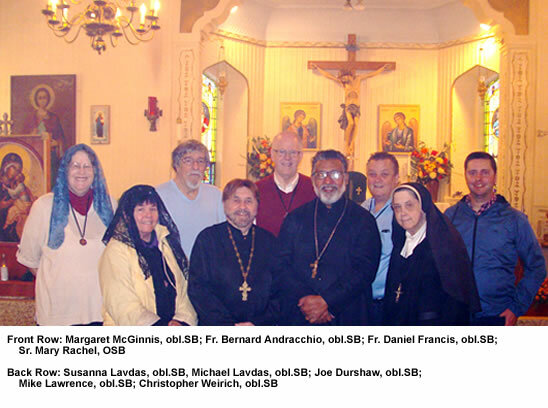 Our Holy Family Chapter, located in southeastern Pennsylvania (north of Philadelphia) meets every first Saturday at Christ the King Orthodox Church. After attending regularly for a minimum of 4 months, you are received as an Aspirant; then, upon mutual agreement with the Director of Oblates, you are received as an Oblate Novice. After a year of novitiate study, you will make your First Oblation; after that you will renew your Oblation every year. The oblation ceremony borrows elements from the monastic profession of vows, although oblates only make promises. Once oblates have been formally accepted into a Chapter, they keep the spirit of St. Benedict in their lives by regular prayer, study and acts of charity in accord with their state of life. Want to learn more? Come to a meeting if you are in the area - contact us for more information or directions. If you are not near us, contact a local Benedictine monastery for chapter information. You are also invited to pray with us, no matter your location. You can also visit our oblate gift shop, where you can purchase items to inspire your faith life. We begin with Liturgy at 9 AM, followed by our meeting in Parish Hall. We welcome anyone interested in oblate life to join us at our next meeting. If you would like to come, please contact us and let us know.